Your kitchen is the centre of your living space. Welcome to Mode German Kitchens. 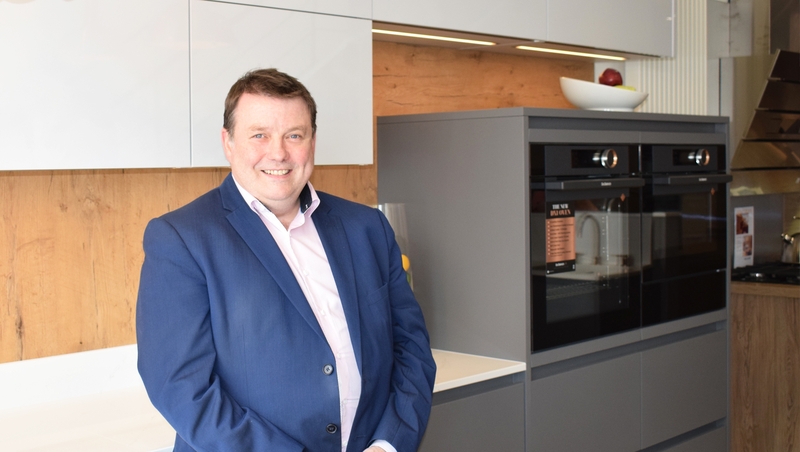 Mode German Kitchens, owned by John Herron, is an independent retailer having formerly been a member of the in-toto Kitchens franchise for the last 11 years. This transition gives us free choice to select the right products for our customers, so we have chosen to work with Brigitte Küchen for our furniture. We are displaying dealers of products from Neff, Miele, AEG, Gutmann, Blanco, Quooker and Elica appliances. We also have a mix of German laminates, Sensa granite, Silestone quartz, Dekton ceramic and Corian acrylic worktops. Our consultation and design process is free of charge and, in order to achieve the perfect kitchen to suit your lifestyle, we are happy to spend as much time as necessary with you, learning about you and your requirements so we can produce a kitchen design that entirely meets your brief. Our spacious design studio displays showcase a range of affordable, high quality German kitchens as well as the latest appliances, worktops, sinks and taps. John’s kitchen background spans 34 years so he brings a wealth of knowledge about design and customer service. With this experience, combined with John’s own skills and personality, you will see the difference to the service we offer. "I work from both a practical & designer perspective - there is no point in having a fabulous looking kitchen if it hasn’t been planned down to the finest details, with practicality in mind." Tell us you’re dream kitchen and what your essential appliances are. We’ll work with you and your budget to give you exactly what you’re looking for. We’ll come to you and measure up the kitchen area or work from plans for a new build or an extension to your home. Your new kitchen will be digitally designed to scale, allowing you to walk around your new kitchen. We’ll discuss each step of the process until it’s perfect for you. Your kitchen will be delivered from Germany within 4-5 weeks. We can coordinate the full kitchen installation for you, or work with an external company. For the latest kitchen ranges and appliances information, download the Brigitte Kuechen brochure.